Shadow Shot Sunday with Harriet. Chicago. It's almost Sunday so I'm heading over to Australia to join in with Hey Harriet's Shadow Shot Sunday #93 meme. 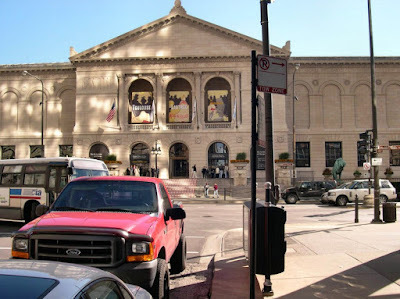 When the Quimper Club got together for their annual meeting in 2005 the host city was Chicago, IL. 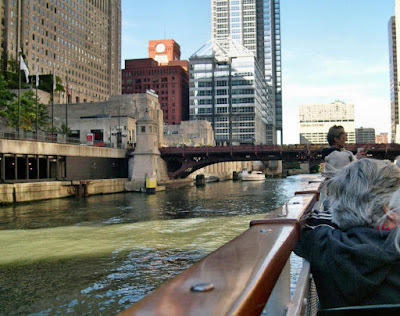 One of the pre meeting events arranged for us, we always try and pack in as much as we can during the 3 days, was a boat cruise along the river through the city. The architcture is stunning and created some great shadows which luckily for me I was able to capture. Some of us were able to see the wonderful Lautrec Exhibition before boarding the boat. 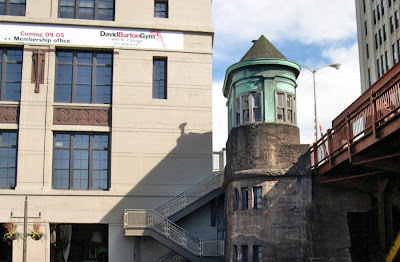 Even back then, before blogging was even a twinkle in my eye, I was looking for interesting shots to bring home to show my DH who was unable to make the trip that year. It's Alphabe-Thursday again so off we go to Mrs Matlock's class to learn about the letter F today. Flowers, Fruit and Faïence some of my Favourite things. A pretty display on top of an antique bow front chest of drawers in the sitting room. Colourful tulips, lemons in a HenRiot Quimper bowl, HB Tabac jar and floral, bird plate from Henriot. HB Quimper floral plate and a Nevers cache pot stand beside a large Sarreguemines platter in the Obernai decor. We purchased this painting whilst living in Bavaria and it's one of my personal favourites. Head over to Jenny's place to learn more about the letter F but do leave a comment before you go. Labels: Alphabe-Thursday, Nevers, Quimper, Sarreguemines. A couple of days ago I came across a recipe for a lemon curd & blueberry loaf cake. Well, I can't find blueberrys here at the moment and I used all my Crazy Jack organic blueberries making muffins last week. But what really bugged me was that I didn't have any lemon curd either..............you're beginning to think I've gone mad aren't you? But, I did have lemons and so I made some lemon curd in my slow cooker. The easiest thing I've made in a very long time. I'm linking to Dining with Debbie's Crockpot Wednesday with this simple recipe, but I'll probably get thrown out as it's so easy to make! 4 oz butter (100g), 4 large brown eggs, (only kidding they can be white!) lightly beaten, finely grated rind and juice of 4 lemons, 1lb (450g/2 cups) fine caster sugar. Melt the butter in a saucepan, add the lemon rind & juice, then the sugar. Heat gently stirring constantly until the sugar has all dissolved. Allow to cool. Stir the lightly beaten eggs into the cooled mixture and pass through a sieve into a 2 pint (1.2 litre/5 cup) pudding basin or souffle dish. Cover securely with aluminium foil and place in the slow cooker. Pour round enough water to come halfway up the side of the basin. Cover and cook on low for between 3 - 4 hours, depends on your slow cooker, until thick. Uncover & remove the foil after about 3 hours and take a peek, I find a quick mix with a hand whisk helps everything to combine and thicken, then cook for another hour. Pour straight away into sterilised jars, fills about 3 depending on size, cool & seal. Stored in the fridge it will last about 3 weeks, if you're not greedy. Fruit curd is a dessert spread and topping usually made with lemon, orange or raspberry. The basic ingredients are beaten egg yolks, sugar, fruit juice and zest which are gently cooked together until thick and then allowed to cool, forming a soft, smooth, intensely-flavored spread. Some recipes also include egg whites and/or butter. In late 19th and early 20th century England, home-made lemon curd (also known in the UK as lemon cheese) was traditionally served with bread or scones at afternoon tea as an alternative to jam, and as a filling for cakes, small pastries and tarts. Homemade lemon curd was usually made in relatively small amounts as it did not keep as well as jam. 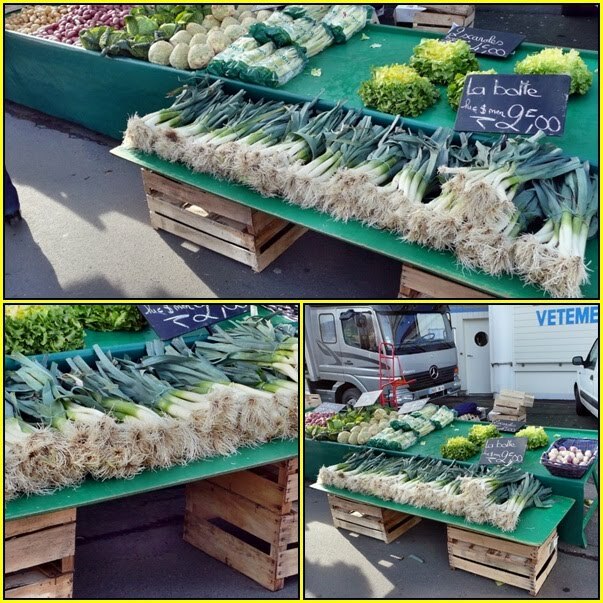 In more modern times larger quantities are feasible because of the use of refrigeration. Lemon curd is still a popular spread for bread, scones, toast or muffins. It can also be used as a flavoring for desserts or yogurt. Lemon-meringue pie, made with lemon curd and topped with meringue, has been a favorite dessert in Britain and the United States since the nineteenth century. 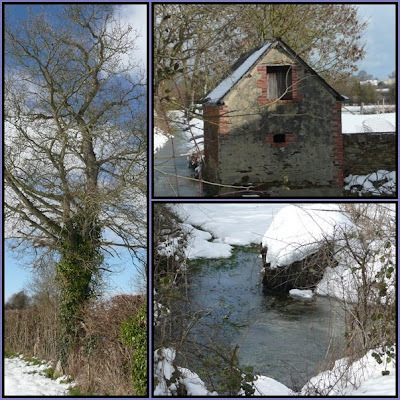 We ventured into new territory for our Sunday walk, even though it isn't too far from us we had never come across this tiny hamlet with the old watermill and rushing stream before. The house bears the VMF plaque, Vieilles maisons françaises (Old French Houses) which we also didn't know about. 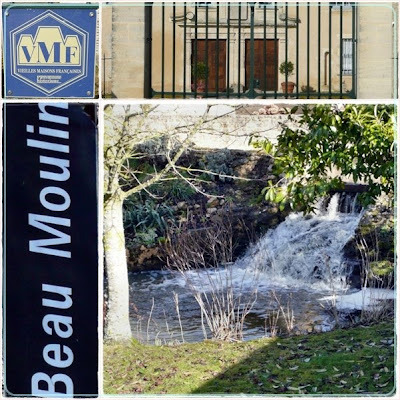 The purpose of VMF is the preservation, protection and enhancement of french heritage and it's architectural environment (source Wikipedia). 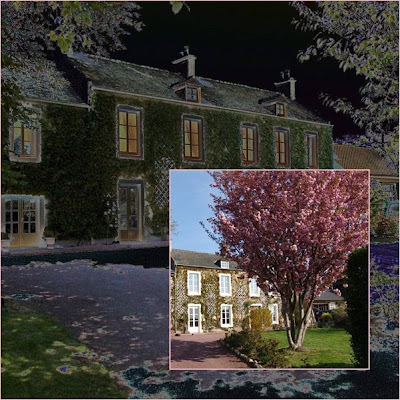 I wonder if they would be interested in our Old French House?? Maybe that way we would be able to discover it's history, since we only have a very sketchy idea so far. Head over to Mary's the little red house for Mosaic Monday, IMHO one of the most interesting blogs in blogland. Labels: Mosaic Monday, Normandy, VMF. For Harriet's Shadow Shot Sunday #92, today @ Hey Harriet , a photo taken in Tulum, Mexico in 2006. Look closely, see the iguana? Head over to Harriet's for more interesting shots. E is for Eiffel Tower on Alphabe-Thursday. In Mrs Matlock's class and Alphabe-Thursday today, we will be studying the letter E.
In Paris, France, E can only mean one thing the 300 metre tall Tour Eiffel, situated on the Champ de Mars,designed by Gustave Eiffel for the 1889 Paris Exposition. Lancashire architects James Maxwell and Charles Tuke designed Blackpool Tower for the Victorian seaside town of the same name, it was opened to the public in 1894, at 158 metres it is much smaller than the Eiffel Tower which was their inspiration. and this is my Eiffel Tower, it stands approx. 56 centimetres tall! At the Quimper Club International annual meeting in Dallas last October, Susan & Sarah used these wirework Eiffel Towers, complete with a jaunty red stetson hats, as the table decorations at the Farewell Banquet. Members attending the meeting were able to purchase them as a souvenir. I didn't attend the meeting as I was enjoying some serious R&R on HHI at the time. A few weeks later imagine my surprise to receive an Eiffel Tower in the mail, sent by Sarah, a gift from two lovely friends Gay & Nina. Click here to see how Gay decorated her Tour Eiffel at Christmas. Now, sans stetson, my tower is home to my small collection of miniature Quimper plates and feves, which I wrote about here. Labels: Alphabe-Thursday, Eiffel Tower, QCI. It's O.K. you can open your eyes now, I haven't created a mosaic of me in my PJ's! After spending Thursday literally in p.j's and staying warm by a log fire, Friday found me in need of a brisk walk in the snowy sunshine, so I grabbed Mr Ben & a leash and off we went, snapping pix around the village. It is pretty isn't it but oh! I am longing for Spring. I'm heading over to Mary's littleredhouse for Mosaic Monday as there's sure to be lots of pretty spring flowers there to start the week with a smile, so why don't you take a peek too? Leave me a comment first though so that I know which randonneurs took a stroll with me today. According to Simon @ TravelMail -"The French term for rambler is 'randonneur' - so much more romantic and rugged than the English word, which conjures up images of Reader's Digest types in search of the nearest Cotswolds tea room." 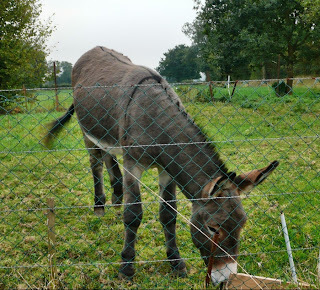 Click here to read his article about walking in the French Pyrenees. 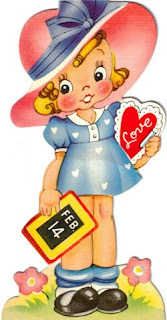 Don't forget that the Quimper Club International blog is celebrating it's 1st birthday today with the 150th post and there is a fabulous heart shaped pendant necklace being given away. It all began with an email from a sweet blogger friend. I want to get together a few food bloggers, send them all some dark chocolate, and we'll all make something for Valentine's day. And post it that day. It doesn’t have to be a new recipe, or an original one. It just has to be something that you love and that you’d love to serve to someone special on Valentine’s Day. Would you be interested? Please say yes! Did I need asking twice?? What do you think? I replied immediately and said "Yes, please!" It wasn't long before I took delivery of this wonderful gift of dark Belgian chocolate gorgeousness. Here it is! The large dark bar is just wonderful chocolate. Me, I'd eat that one. The ones in foil are what use when I cook with chocolate. But they are good to eat too. The small one is handmade by Christophe and makes wicked hot chocolate. Whatever you do with the, I hope you enjoy them! How could I resist, especially as Kate almost insisted? I broke off a small piece from the largest bar, mmmmmm, heaven. 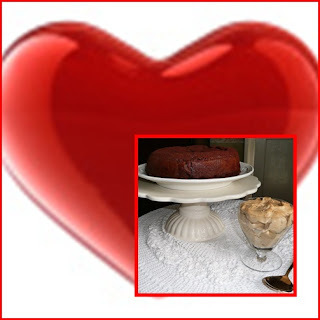 So, what did tempting treat did I make for my Sweet Valentine. 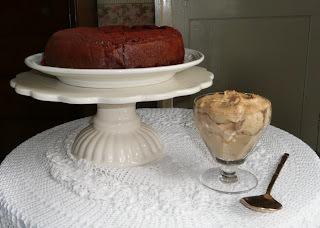 Chocolate expresso cake with caffe latte cream, so wicked, so decadent, so wonderful! From Nigella's "FEAST Food That Celebrates Life", see her recipe below. When I removed the cake from the oven the top was firm to the touch but inside was all dark chocolate squidginess and mousselike. 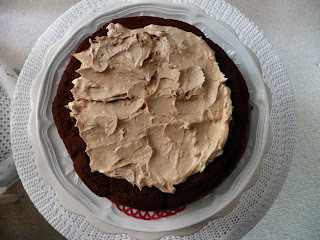 Once it was cool I dusted with cocoa powder and then just before serving piled the cream in the sunken centre of the cake. The combined taste was very reminiscent of a Tiramisu dessert, thanks to the Tia Maria liqueur! Cupid is never far away on Valentine's Day. Pretty heart shaped plates, "Love Letters" from William Sonoma. Melt the chocolate & butter in the microwave or or double boiler, allow to cool slightly. Beat the eggs, sugar & vanilla together, until thick, pale & moussey. The mixture should double in size, I used my Kitchenaid freestanding mixer which made the task easier. Fold in the flour & espresso powder, keeping as much as in the batter as possible, then add the melted chocolate & butter, folding it in gently. Pour into prepared tin and cook for 35 - 40 minutes. The top of the cake should be firm to the touch but underneath still a little bit gooey. Poor over the Tia Maria before allowing the cake to cool completely. For the cream, melt the white chocolate, as before and let it cool, fold in the cream & the espresso powder whipping together until it thickens. Release the cake from the springform tin, dust with cocoa and serve the creme in a bowl or pile the creme into the slightly sunken centre of the cake. Carolyn who is blogging over at the QCI blog this month and I have been friends for about 10 years now. 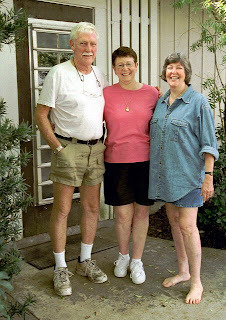 For Suzy's Flashback Friday @Kitchen Bouquet here are some pix from 2002 when Mr B & I visited Carol & Bill at their home in West Palm Beach. 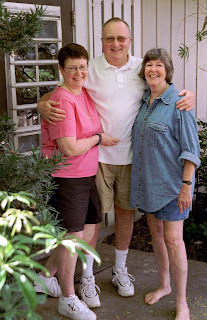 As we were on vacation in Florida, Carol & Bill suggested that we drive down and spend a couple of days with them. They had a lovely guest apartment in the grounds, situated in the same building as Carol's studio, which contained a cabinet where she displayed the beautiful "faberge" like eggs she painstakingly created. Sadly, I don't have a photo of the cabinet but Carol will be blogging about them very soon @ QCI Blog. Labels: Carol and Bill, Flashback Friday, Florida, Kitchen Bouquet. 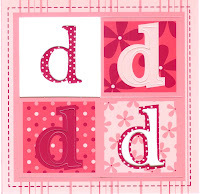 Thursday's here again so I'm off to Jenny Matlock's place for Alphabe-Thursday and a look at what this week's letter D stands for. 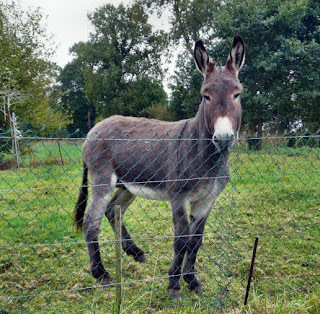 Around here D stands for my neighbours Donkey, who has a field to wander in but more often than not can be found standing by the fence watching the cars and the one lone pedestrian, me with Mr Ben, going by. 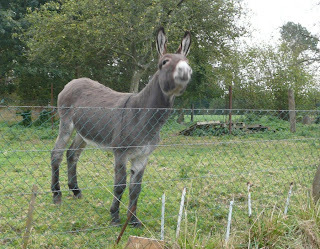 He's very sociable and always comes over to have a chat and tells me the latest gossip around the hameau. Port en Bessin, Dimanche matin. 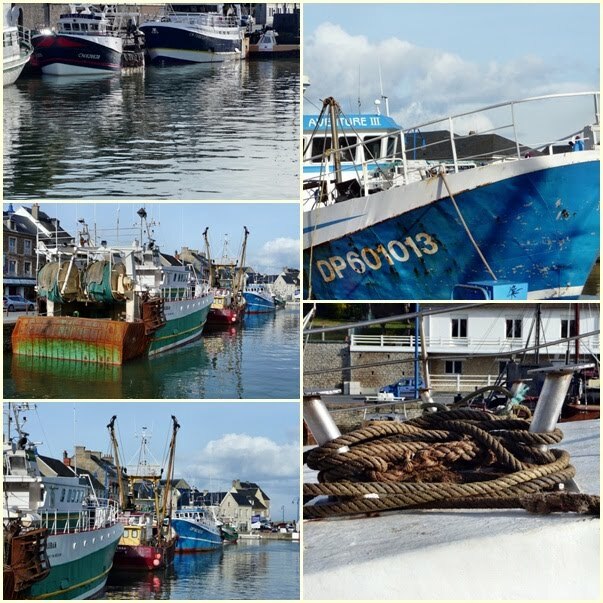 Some shots of the outdoor produce market and fishing boats, taken last weekend at Port en Bessin, for Mosaic Monday @ the little red house & Outdoor Wednesday @ A Southern Daydreamer, two of my favourite blog parties, graciously hosted by Mary & Susan. I hope you don't think that I'm starting the week short changing you by using one set of pix for two meme's but, oh! I am so busy at the moment. 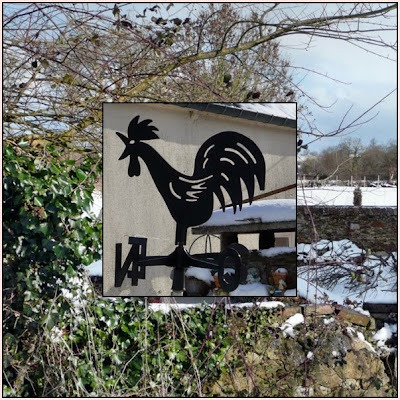 You may have noticed that I'm also over at the Quimper Club International blog this month showing Carolyn the ropes. As a first time blogger Carol has been sharing with us how she first discovered Q and her recent trip to Costa Rica, soon we'll learn about her talent as a restorer of ceramics. Her w ork is truly amazing. Also over at QCI this month our First Year Anniversary, and we're giving away a marvellous Henriot Bijoux necklace to one lucky visitor. Click here to find out how you can be our winner. 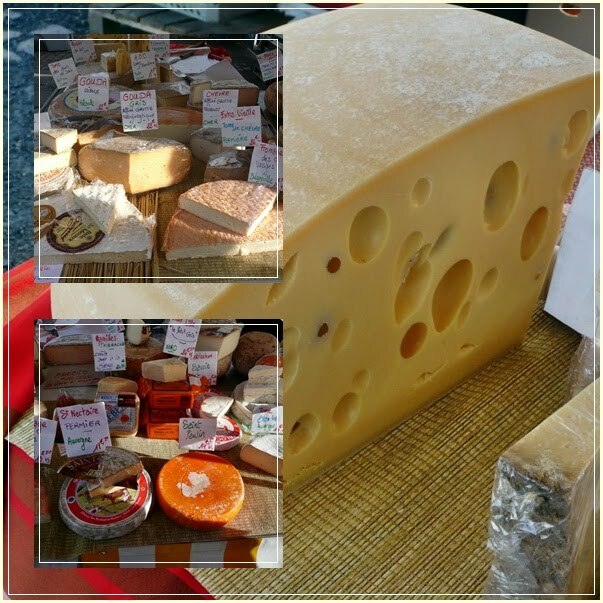 The piece of Emmenthaler cheese in the above mosaic was huge, I wanted to make sure you saw how enormous it was! If you've enjoyed the pix today please leave me a comment, you can leave one if you didn't like them too, if you must!! 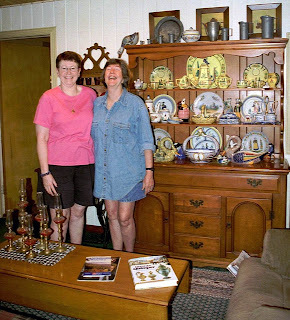 Then head over to see Mary & Susan and tell them I said "hi". Labels: Mosaic Monday, Outdoor wednesday, Port en Bessin, QCI. 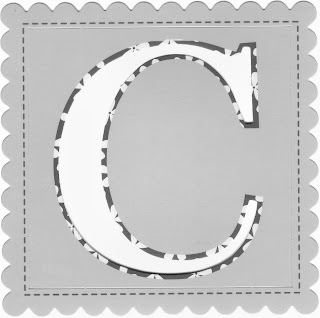 It's that time of the week when we head over to Jenny's blog to participate in Alphabe-Thursday and this weeks letter "C". I'm also linking this post to Suzanne's Colorado Lady Vintage Thingie Thursday because it's not just the camera that's vintage, I am too! Last month my friend Mary @ Across the Pond blogged about her home town of Torquay situated on the English Riviera. She shared some beautiful photographs taken on one of her favourite walks. After I had read her post I have to admit to feeling a little nostalgic for England, I have fond memories of holidays spent in Torquay when I was a very little girl. 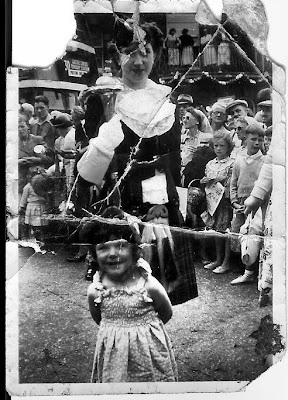 Nana and me aged 3, in Torquay. So, I took down, from the top of the wardrobe, my favourite pink hatbox where I keep all my old family photo's, cards and letters. 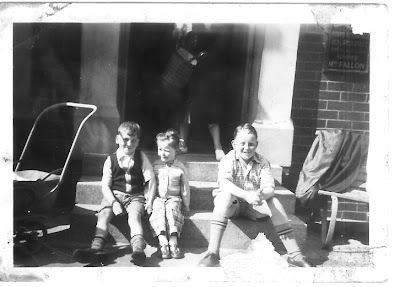 There they were, old black and white photographs taken by my parents with their Brownie "Box" camera. I still have the shabby old Kodak No. 2 Brownie camera that belonged to my parents, it now sits on a shelf in my library. and in the centre: Use Kodak Films No. 120. I tried to photograph the logo but it was unclear. This is a shot of the inside. Me and my boyfriends, can you see that the little boy on my right is holding my hand. I think this was taken on my 4th Birthday. I've shown this photo before, but I think I look sweet, so here it is again! 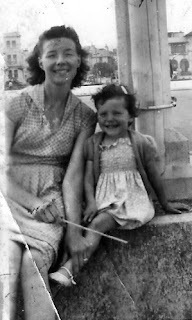 My Mum & me having a lovely day at the seaside. 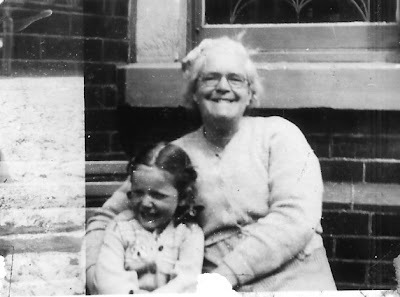 I love the handsmocked dresses and handknitted short sleeve cardigan that she made for me, so very 1950's. 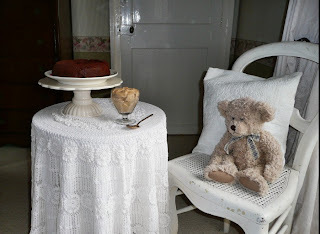 Do pop over to Jenny & Suzanne's blogs and see who else is there, but not before leaving me a comment so that I know who came calling in Normandy today.